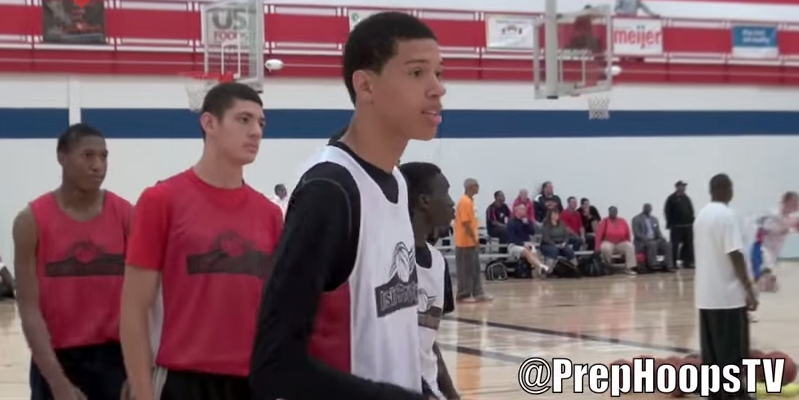 Trevor Manuel, the Lansing Everett High School power forward, is 6’9″ and does it all. Perhaps the tallest member of the Oregon Ducks men’s basketball 2015 class, the 4-star recruit out of Michigan dunks, shoots three pointers, grabs rebounds, assists and has superb ball handling skills. Last night, Manuel posted a triple-double against Ottawa Hills, finishing with 42 points, 14 rebounds and 10 blocks. Manuel transferred back to Everett High School for his senior year after playing a year at Oak Hill Academy in Mouth of Wilson, VA., a school that has seen the talents of NBA superstars Carmelo Anthony, Kevin Durant, Rod Strickland, Steve Blake and Rajon Rondo. Players with big potential have transferred to Oak Hill for the experience and exposure, often staying for a season and leaving much improved. “It’s nothing but helping me. Playing against the top players every day in practice and then going to play with them in the games, it just put my game a little bit further ahead of everyone else around here,” Manuel told MLive. While Manuel could easily play center for any team, this lanky yet powerful young man is often a perimeter player, putting opposing coaches in a tough position: double-team Manuel and risk creating unguarded players or the unenviable task of matching him up one-on-one. Manuel wanted to play against the best to improve his game. Oregon freshman Jordan Bell is a big contributor for a young Duck basketball team. “He’s the real deal. He’s legit. We don’t have an answer for him and he’s 6-foot-9, 6-10 and shooting 3’s and handling the ball,” Waverly High School coach Craig Fields told the Lansing State Journal. Manuel will join a young Oregon men’s basketball team that currently depends upon the talents of freshmen Jordan Bell, Dillon Brooks, Ahmaad Rorie and Casey Benson. These freshmen standouts see significant playing time and have matured quickly as the Ducks push through the regular season. 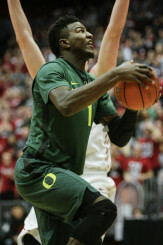 This year, Oregon head coach Dana Altman has shown that he’s not afraid to put young players in the spotlight. Next year there should be nothing to fear with Manuel playing for the green and yellows.